Eleven-year-old Julia is, by all appearances, a typical southern California preteen. She tolerates soccer practice, does well in school, looks forward to sleepovers with her best friend, and is becoming ever more critical of her parents and aware of changes in the social dynamics of the kids around her. In THE AGE OF MIRACLES by Karen Thompson Walker, Julia will lose friends, fall in love, learn harsh truths about her parents, and experience the types of happiness and tensions found in coming-of-age novels. What is remarkable about this inventive story is that Julia does all of this against the backdrop of a cataclysmic upheaval on planet earth. 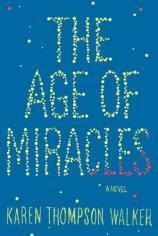 "THE AGE OF MIRACLES is an absolutely wonderful, magical debut. It’s an inventive story, combining classic coming-of-age themes with the horror of natural disaster of apocalyptic proportions. 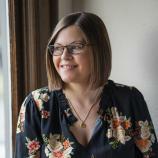 Karen Thompson Walker perfectly balances the two, creating a seamless novel that is at once familiar and totally surprising." The book opens as Julia and her parents, former actress turned teacher Helen and obstetrician Joel, learn that the earth has begun to slow its rotation. Time is now meaningless as each day becomes longer than the one before it and the nights also get longer. Gravity is affected as well, and birds begin to fall from the sky. Over the next weeks and months, people notice other affects, such as balls are harder to kick and hit and a mysterious sickness begins to affect a percentage of people. Panic ensues with gas, food and other supplies being hoarded. Eventually the government declares that, despite the fact that daylight may now last for far more than 24 hours and nights just as long, the U.S. should continue on with 24-hour days, which is to be called Clock Time. However, some people resist Clock Time in favor of Real Time, insisting that humans will adjust to the new natural norm. Soon society is divided between those who follow Clock Time and those who follow Real Time; some Real Timers become targets of their neighbors, while others take off for colonies where they can observe time as they choose. Within the year, the earth is affected by solar flare storms, and the magnetic forces of the planet continue to break down. All the while, Julia goes to school, dealing with bullies, girlfriends who change, and teachers who leave. It is hard to know how much of the tensions with which she grapples are because of the planetary problems and how much are normal middle-school tribulations. Her mother becomes increasingly afraid and sick, and though her father maintains a calm exterior, he may be responding to the crisis in an equally damaging way. But in the midst of the devastating reality and as she approaches her 12th birthday, Julia finds an ally in a smart, quiet and sad boy named Seth. As the world around them grows scarier and more dangerous, Julia and Seth offer each other comfort, honesty and love. But there is no stasis in the story, and this relationship is ultimately at the mercy of the planet’s slowing. THE AGE OF MIRACLES is an absolutely wonderful, magical debut. It’s an inventive story, combining classic coming-of-age themes with the horror of natural disaster of apocalyptic proportions. Karen Thompson Walker perfectly balances the two, creating a seamless novel that is at once familiar and totally surprising. The language is straightforward, the characters complex, and the plot superbly paced. It is fantastic without fantasy, scary without outright terror, and lovely without sentimentality. For Julia, the “age of miracles” is not, as she looks back at the year the world slowed down, living through such disaster, but living through early adolescence. Walker realizes the beauty and trauma of that period for young girls, when it seems that time and gravity lose meaning and the world must be understood anew. She compares it to a physical event that forces the same modes of re-thinking, re-learning and survival.